I just deposited my one and only shining light of a daughter at college this week, and it’s got me thinking – about many things, but mostly about the passage of wisdom from one generation to the next and the ceaseless march of time (and the boot prints it’s left on my face). It’s also got me trying to properly balance a cocktail of psycho-pharmaceuticals with a raging hormonal imbalance while swimming in a veritable river of dirty martinis, but that’s a tale for another day. It seems like only yesterday I was a student myself, though it was actually so long ago you could measure the time in geologic eras, or at the very least dog years. As is invariably the case with the long dead past, it now seems like a much simpler time: the scourge of AIDS had yet to destroy promiscuity (though herpes had taken a lot of the spontaneity out of it); you didn’t need an advanced degree in molecular mixology to make a gin and tonic; an ounce of weed could be financed with a simple ATM withdrawal (I am told) rather than requiring a leveraged trust fund payout or a significant shift in the futures market; and Eddie Murphy was actually funny. These days, however, our best and brightest enter the hallowed halls of higher education only to contend with the complexities of speech codes, the ins and outs of political correctness, exacting recycling rules and a steady stream of “chem-free mixers.” I don’t know whether the last is a soft drink or a no fun allowed social event, though really what difference does it make? In any case, I think it’s safe to assume that navigating the transition to adulthood is a bit more challenging than it once was, what with one thing and another. Your underwear should be concealed by your clothing. Now how in the name of all that’s holy this poor gal concluded that this was any way to leave the house I cannot say. Perhaps her mother forgot to tell her that a bra is not a blouse, or maybe she’s blind and accidentally put on her boyfriend’s jock strap instead of a tank top while dressing that morning. I don’t know, it could be she somehow got her outfit on sideways. It doesn’t really matter how this fashion equivalent of a crime against humanity found it’s way to the public view. What matters is that it never happens again. Ever. So ladies, please take my advice and leave something – anything really – to the imagination. Give your friends and neighbors something to wonder about. Maintain an air mystery as to what’s happening under your dress, because unless you’re Giselle Bundchen, the reality is often a tad disappointing. Apparently the little kitty sphincter acts like a suction cup. Who knew? Just because you can, it doesn’t follow that you should. This has so many applications, it’s hard to know which to choose. OK, let’s just say, hypothetically, that you have excellent balance and posture and that your house cat likes to ride on your head and will calmly do so, even when taken out on busy city streets. 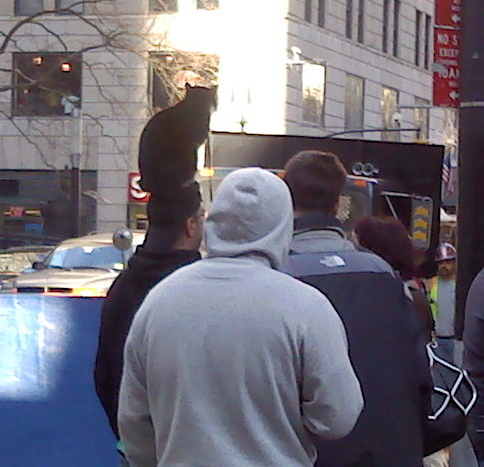 Does this mean you should drag said cat outside on a cold winter day and parade around — oh I don’t know — lower Manhattan, for example, with it perched on your head? I think you know the answer. I think we all do. Your teeth are not tools. Do not use them to open bottles. Except in emergencies. That was not an emergency. Thank heaven for screw top bottles. And toga parties. Photos of Cat Head and Bra Girl are both property of WS Winslow. Posted on August 30, 2012, in Friendly Advice, The Slattern Speaks and tagged Brassiere, Discovery Channel, Eddie Murphy, Humor, Madonna. Bookmark the permalink. 20 Comments. I could do without seeing another pair of thongs cutting into someone’s backside. Makes me want to cut them loose and then take them shopping. You’d need some LARGE shears for that thong, my friend. I’m not necessarily a cat person, but there is no way in bleep that I’d ever allow a cat on my head. Better to have a cat on your head than in it, I suppose. I picked the Pats and Giants out of pure, masochistic loyalty. I’m waiting for my miracle — and that Visa card will buy a lot of Superbowl party fixings. If I could give client presentations with a cat on my head, there would be no upper limit to the fees I could command. I’m frankly jealous of Cat Head Man. Have you considered wearing fancy underwear? On your head? Less chance of claw marks to the scalp. Those are some nuggets of wisdom that are rare indeed! You are a wise woman. I snapped the photo myself because I knew no one would believe me. Usually you don’t see stuff like that outside the East Village, but I spied this guy on lower Broadway last winter. I swear. Great piece…I can’t imagine my little darlings flying the coop…yet. Actually, on some days I can. Vividly and in technicolor. On a totally unrelated note, I read this article on Martha Stewart a few days ago, and thought if anyone could turn it into a funny blog post, it’s you…. Ah Martha. She is truly the gift that keeps on giving. And let me tell you, by the time the chilluns have reached 18, you’ll be standing by the front door with a suitcase, not because they’re anything less than spectacular human beings, but just because it’s time. OMG! I was chuckling out loud! That’s some great advice there. From a Mom who’s son just flew the coop for good to his sophomore year at college and summers to Army ROTC. It’s nice to have company in the nest. I have to say I was excited about it as he was. Oh the places he will go and the crap I won’t have to clean up! LOL! OH… so THIS is where you have been. Now your late-night post has forced me to pour another glass of wine, so that I could read it more thoroughly…thanks…Wendie…. and congrats and your daughter trading the coop for college. You’re not going to be one of those mothers who drops in to your offspring’s dorm unexpectedly, are you? Unless there’s a portable bar set up in her dorm room — and there had better not be — I won’t be hanging around. OOH nice new picture, Susan! I loved your last post but could only read it on my phone and so couldn’t comment. Definitely one of your BEST. Thx, Wendie – on the post and the pic. People have told me the picture doesn’t really look like me, so I’m going to replace it with a picture of a Chinese water buffalo instead. As long as you’re using this for your online dating profile….